This 6 Bedroom 5.5 bath home sits on a very spacious lot that offers a main house and carriage house and an enormous courtyard that is bordered by a wrap around veranda and balcony. An impressive Arched Mahogany Door allows a New Orleans style entry from the Boardwalk into the side porch of the Main House. No less than 6 sets of French doors flow out to the Courtyard from the first floor open Living/Dining/Kitchen with an alcoved sitting room and Full Bath. The second floor consists of the Master Suite with Bath as well as a Bunk room and 2 Guest Bedrooms and Guest Bath. The third floor houses a Party Room with side bar that may be converted into an extra Guest room with 2 trundle built in beds and a full Bath. The Carriage House located above the garage has a separate entrance outside the Courtyard and offers a Living/Ding/Kitchen with a half bath and bunk room and a guest bedroom and full bath. 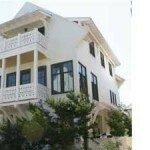 This 4 bedroom 4.5 bath home constructed by Ledman Construction sits across from the Barbados pool. This exquisite home offers beautiful views of the Gulf as well as the amazing views of the community from the second and third level balconies. This home features the best quality and craftsmanship concrete block exterior walls with stucco, high impact glass windows, all insulated interior walls, Rinai hot water system, surround sound, crown moulding, white oak floors throughout, travertine floors/showers in baths, heated tile floors in baths, granite counter tops, Viking stainless appliances, custom built cabinets, high quality fixtures, parking in the rear of the house, and a covered porch and courtyard.Located just a few steps away is the beach access to the Gulf! 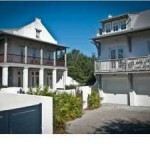 This Gulf Front 4 bedroom 4 bath home is located on one of the Rosemary Beach boardwalks and has never been rented. 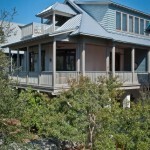 Enjoy sweeping views of the Gulf and lots of light and Gulf breezes flowing through this home. There are 3 bedrooms and baths located in the main home and an additional bedroom in bath located in the carriage above the 2 car garage. 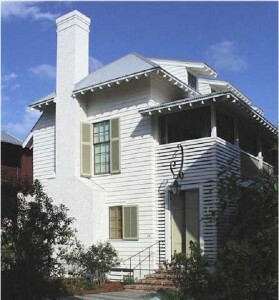 There is a courtyard area located between the main home and carriage. Don’t miss your chance to own this well planned, well appointed McAlpine Design home on the Gulf side of Rosemary Beach (South of 30-A), This home offers two and a half stories of gracious living. This Charleston side yard house includes the warmth of a fireplace in the living room, hardwood floors throughout, mahogany french doors, custom cabinetry, granite kitchen counter tops, stainless steel appliances, wide two story porch and lush courtyard with fountain. The beach is just a short walk away down the pedestrian boardwalk. 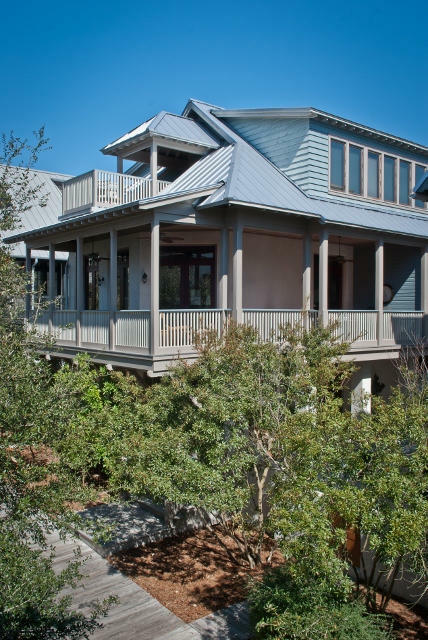 If you have not had a chance to check out the 2012 Coastal Living Magazine’s Ultimate Beach House in Rosemary Beach … you better hurry because the tour ends this Sunday, October 7th. Tickets are $15/person and can be purchased at the house which is located at 194 West Kingston Road in Rosemary. The home is available to view on Friday and Saturday from 11-5 and Sunday from 1-5. 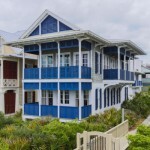 Coastal Living Magazine chose beautiful Rosemary Beach for its 15th Anniversary Ultimate Beach House and the tour began after completion in late June 2012. Residential designer, Lew Oliver with Whole Town Solutions was influenced by the British Colonial architecture of South Africa and also found great inspiration in his design by Scott Merrill’s Town Hall in Rosemary Beach. The home was built by Stan Benecki with Benecki Homes, decorated by Erika Powell with Urban Grace Interiors and the impeccable landscape design was by Alec Michaelides with Land Plus. For more information visit Coastal Living Magazine online. The people who visit aren’t looking for water parks or the party scene. Instead, they are drawn to the town’s quiet appeal. With its brick roads and Bohemian feel, Rosemary Beach has a small-town handshake with the pulse of a vibrant city. On any given day you’ll see colorful bikes strewn across a lawn, children playing in the sprinklers, an art show at World Six Gallery or people enjoying one of the many restaurants. “We’re actually staying in Panama City Beach, but we wanted to get away and come here for the day because it has more charm,” Godwin said. “We like it here because it’s peaceful and quiet,” Godwin said.